It’s the most wonderful (and freezing!) time of the year as the holiday season is here and Christmas is only weeks away! We’re helping the U.S. Marines once again this year with the Toys for Tots campaign, which runs through December 18th, and our office is an official drop-off location for the program. Stop by any time during our business hours (9AM to 7PM) and help put a smile on the faces of less fortunate children and contribute to giving them a great Christmas! No gift is too small or large, all we ask is that toys are new and unwrapped. 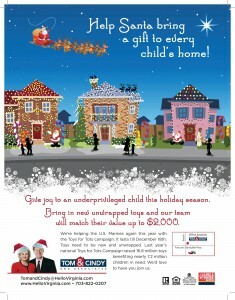 Let’s try to do our part in offering a helping hand and beating last years campaign which raised over 16.8 million toys nationally!